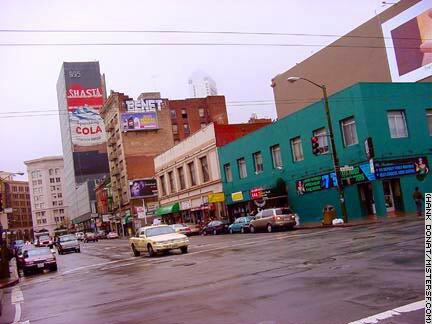 When a November, 2001 storm damaged aluminum covering on the south side of the Hewes building at 995 Market Street, a pristine '50s-era painted Shasta billboard was revealed. The soda company called the recaptured piece of Americana "Miracle Art" and immediately promoted the discovery by announcing a $10,000 reward to find the artist as well as plans to create a vintage style commemorative can. Art, history, architecture, and nostalgia buffs were also elated by the discovery. Then on April 1, 2002, without much ado, the five-decades old sign was replaced by a brand new Nike ad. Andrew Meieran, president of Albion Pacific LLC, the company that owns 995 Market, tells Mister SF the Shasta ad is still intact beneath a vinyl cover. The future of the Miracle Art depends on Albion Pacific coming to term$ with the soda maker. After the Chronicle did a story on the sudden appearance of the Nike ad, Albion was derided for its seeming act of corporate crassness and cultural insensitivity. In a typically San Franciscan confrontation that pits commercial interests against fans of art and pop culture, the case has ended up in court. San Francisco Wallscapes, a company that had leased the Hewes building outdoor space, wants to continue putting its ads there and has sued to assert its right to do so. See Rigo and 17 Reasons.